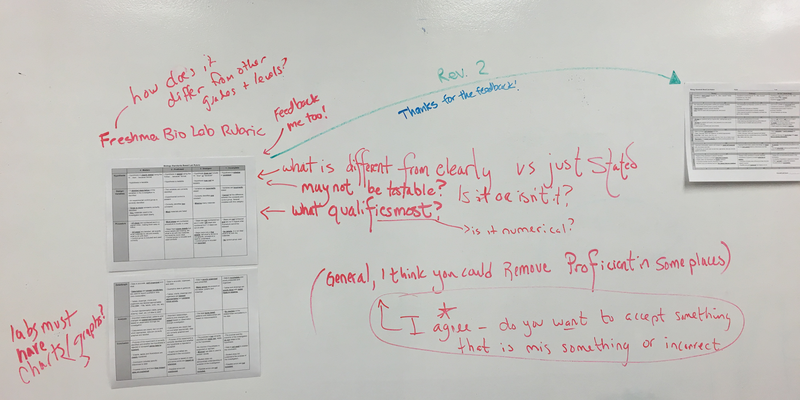 Sometimes in the CollabLab we hang unit plans, lesson plans, or assignments up on the dry erase wall to request interdisciplinary feedback from our peers. It's a great opportunity to provide a consistent message to our students and reflect on our own instruction. We did this for our writing rubric in regular & honors biology and AP English. At first glance, you might not think there’s a large overlap between the subjects; however, we realized quickly that the writing skills in one class can inform those in the other. In English, I have recently moved to a 3-degree rubric: mastery, proficiency, and “not yet.” The way I think about it, a 4-degree rubric still accepts borderline unsatisfactory work. Instead, proficient shows that the student technically understands the skill and has demonstrated it in their work. Mastery, however, moves to a more successful, argumentative, or stylistic demonstration of the skills. I’ve also taken up the language I’ve seen online; instead of having a “revision” or “unsatisfactory” category, I’ve labeled it “Not Yet,” indicating that students can progress to the next level. Yet I wasn’t sure of a straight 3-degree rubric because even AP considers “rising” and “falling” scores,” so I added two categories in each area, which also satisfies a points-driven report card. Ideally those point values would go away and students would be able to focus on honing skills-driven writing. 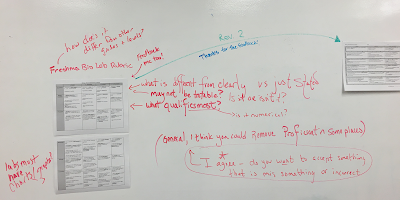 The feedback from the team involved wording and whether students were familiar with the language on the rubric and how well this aligned to the College Board's actual holistic scoring guide. Based on discussion and feedback with colleagues, I made some changes to condense the original rubric with aim to make it clearer. This involved having fewer descriptors and including "rising" and "falling" scores to provide some wiggle room when grading, making the score translate better into the grade book. Here is the second revision. In biology, next steps within the process of skills assessment will be to gather student samples that can be used as models in the development of skills. These models can be used as guides or as a way to train students to further understand the expectations within the rubric. More on common rubrics soon! Big conversations are happening!